It’s a pretty well-known fact there are people in the community who are just out for themselves as far as gaining a lot of attention. It’s no different in the Japanese American community and since they are so good at it, they do get a lot of attention. However, at the same time, there are others in the community who go about their duties without seeking recognition for their contributions and accomplishments. Dawn Tomita is just such a person, and I’ll bet not many people have ever heard of her. Perhaps the news section of The Rafu will carry her story, but in the event that it does not, I thought I would toss it in my column. Dawn is the city manager for the City of Lomita, a small South Bay city located next door to the City of Torrance. She is the longest-serving city employee, having been hired in 1964 as a secretary and then rising to the top administrative post. That means she has served the city for 47 years and now has announced her retirement, which will take effect on May 1. I doubt if there is any other city official in California or any state who has served as long as Dawn. She has outlasted 40 different city heads. Dawn was raised in Harbor City and attended Narbonne High School. She was hired two weeks after Lomita was incorporated as a city on June 30, 1964. She was promoted to deputy city clerk in 1969 before rising to become the city clerk, which means she swore in every City Council member except five who were on the panel prior to her taking her position. Even though she is leaving her post, she said she will continue to live in Lomita with her 91-year-old mother and couldn’t think of anywhere else she’d like to live. The police got involved in a car chase that ended with the driver jumping out of his vehicle and trying to escape on foot. However, the police cornered him and he pulled out what was probably thought to be a handgun. So the police fired their weapons, killing him on the spot. It was later discovered that the driver had a cell phone in his hand, which he pointed towards the police. Now, the family of the slain youth is suing the LAPD for $120 million (which we taxpayers will cover). Yes, I feel for the family of the slain youth, but hey, he was running from the police during the car chase. Will the family win their suit? Probably. So, as I said, what’s this world coming to? What country outside of Japan has the largest Japanese population? The country with the most Japanese outside of Japan is Brazil. There are between 1.4 and 1.5 million Japanese living in Brazil. I can believe that. When I went to Sao Paulo about a dozen years ago, I was amazed at the Japanese community there. It felt like I was walking in the Ginza area of Tokyo when I walked through the “Japantown” there. In the evening when I went to one of their nightclubs, I also felt like I was in the Ginza. They had Japanese hostesses who sat with the patrons at every table. The reason I am mentioning this is that a lot of Brazilian Japanese traveled back to Japan in recent years. This, of course, is unlike the Japanese Americans, who never “moved back” to the country of their parents. At the height of Brazilian Japanese returning to Japan, the population topped 300,000 in the year 2008. However, the population slumped by 100,000 at the end of last year. Still, despite the dramatic fall-off, Brazilians remain the third-largest minority group in Japan behind the Chinese and Koreans. An interesting story, I thought. This thought struck me when I glanced at Page 2 of Wednesday’s Rafu, which carried the results of the NAU basketball playoffs complete with action photos taken by our photo editor, Mario Reyes. It was Mario’s photos that prompted me to touch on the NAU stories. He had four photos on the page. Excuse me. Aren’t these stories about the NAU (Nisei Athletic Union)? Where are the “Nisei” (or “Sansei”) participants? The NAU used to be called the JAU (Japanese Athletic Union) before WWII put us all away in camps. 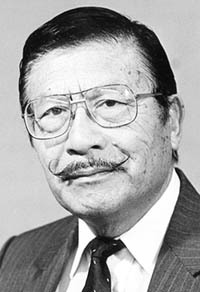 So, when we returned and the league was reorganized, the late Akira Komai, who put the program together, renamed it the NAU and the requirement to participate in the program was that one had to be of Japanese ancestry. The reason behind this had nothing to do with race as it might appear. It was that it gave the Japanese Americans a chance to participate against other Japanese Americans because in a sport like basketball, the JAs were physically able to compete against those of similar size. After all, there weren’t any 6’10” Nisei basketball players. In fact, as I mention from time to time, the only non-JA who was allowed to participate in the program was Jerry Chan, a Chinese American, who was also the tallest to compete in the NAU at 6’1” in height. Now, in checking the box scores, I see names like Won, Chang, Louie, Maldonado, Olsen, Hawkins, Schultz, Luong, Graves, Lising, Born, etc., etc. Oh yeah, one of the top stories circulating in the media these days is on the proposed fast train project to Las Vegas. Most of those who respond to the project say the project will fail if it does become a reality. I agree. The proposed line won’t connect Vegas to Los Angeles but to Victorville. So, those taking the train will have to drive to Victorville, pay for parking at the station there, then board the train for the remainder of the trip to Vegas. The fare is said to be about $100 round trip. As most of you know, I drive to Vegas for my trips. It takes a little over an hour from Gardena to Victorville. The toughest part of our Vegas drive is from Gardena to Victorville. After that, it’s a breeze. So, who would drive the toughest part of the trip and then jump on a train? Who thinks up these ridiculous ideas? Now, if the train ran from Los Angeles (or even Long Beach), it might be another thing. At least the stories on the new project say there are mostly “skeptics,” including me. Yes, the car I own is a Toyota Avalon. I can attest to the quality of the “old” model Avalon. Can you believe I have logged 212,000 miles on my Avalon? The most mileage I ever got out of my previous cars (all American-made) was about 80,000. The 2013 Avalon’s design is similar to the new Chevy Impala. At my age, I don’t even consider buying a new car, but with the amount of mileage I have on my Avalon, I might have to reconsider my thinking. I don’t know how many trips to Vegas I have left on my present Avalon. Hey, if you see a broken-down white Avalon on Highway 15 en route to Vegas, check and see if I’m sitting inside. Oh yeah, the new Avalon will be priced at about $33,000. That’s out of my league, too. Maybe if I were a Japanese baseball player in the Major Leagues, I might be able to afford the new Avalon. Heck, even Sansei Kurt Suzuki from Maui, with the Oakland A’s, earns $5,000,000. I guess I should have traded in my typewriter for a baseball glove. When the repairman arrived at the apartment the following day, he discovered the biggest, meanest-looking bulldog he had ever seen. But, just as Wanda had said, the dog just lay quietly on the carpet, simply watching the repairman go about his work. The parrot, however, drove him crazy with cursing and name-calling.